The Art of Robin Baratta: What Makes a Professional Artist? What Makes a Professional Artist? I've been pondering that question a lot lately. I call myself a professional artist, where as some of the best artists I know, don't. Or a combination of the above. I used to spend some time hanging out in the business forum on wet canvas, before Facebook drained the energy out of it, where one hot thread was started by a dude who loadly claimed that anyone who couldn't support a family of four on their art sales was a poser. The argument raged for weeks. I know certain degree'd artists who think only other B/MFA's should be admitted into the 'real artist' category, and getting into their circles/shows/galleries are almost impossible with out a degree. I fit into neither group, but I call myself a professional artist. I am not happy, or nice when I deny that simple reality. Yes I make a living, meager though it may be, from my art business, is that the deciding factor? Or is it the fact that art creation and teaching is infused with my soul. It's always present in my consciousness. It's how I dress, how I act, how I think and speak. I work full time, actually a lot more than full time at my art business. Only a fraction of that time is spent painting. I actually have to guard my studio time like a jealous miser, the rest is spent, preparing lesson plans, teaching, doing administrative/marketing work, and shows/gallery work, is that it? 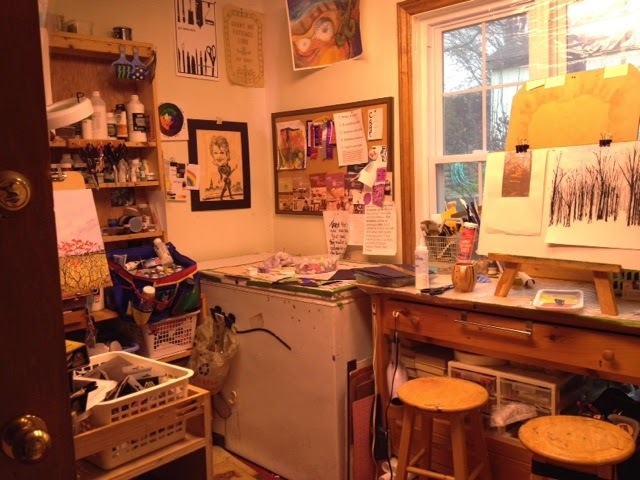 My studio, with two paintings on the go and lesson prep too. What do you think? Add your comments. My monthly newsletter contains a peek at what's on my easel, the stories behind my works, art news and tid bits of (I think) interesting info. you may unsubscribe at any time, and I promise to not share your information with any one.